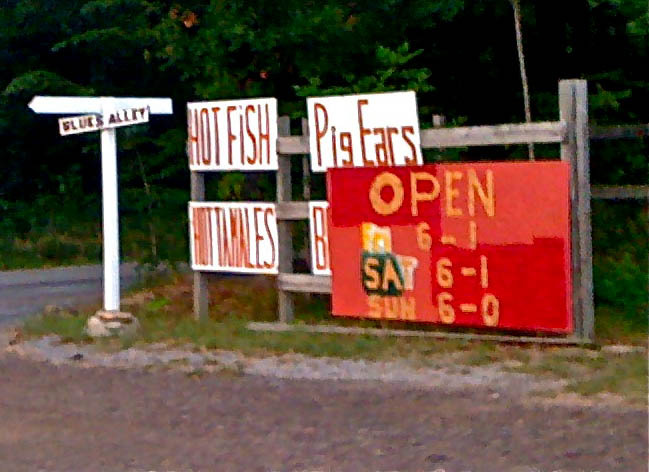 Not two miles in, a wooden sign for “PIG EARS” and “HOT FISH” launched an impromptu dinner at the Family Reunion Shack, which turned out to be everything one could ever want in a rural, roadside club. 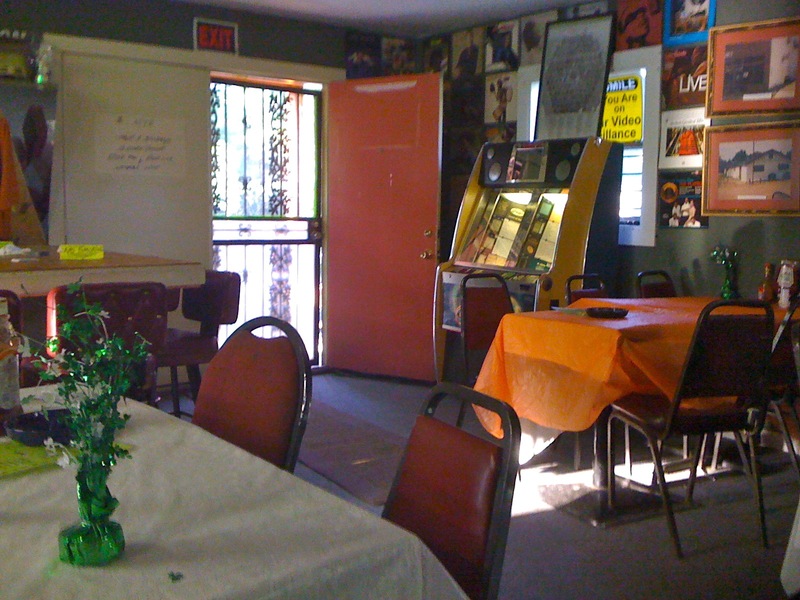 There was blues in the jukebox; grease in the kitchen; pool tables on pressboard floors; and a large painting of the Last Supper. Also on display: An impressive collection of blues album art, old photographs, and numerous signs discouraging such unruliness as dancing on pool tables, smoking at the cash register, and using profanity. It is, after all, a family operation. The couple in charge moved to Terry from Jackson many years ago. And they can cook. The pan trout, in particular, is not to be missed: battered and seasoned to Southern-fried perfection. 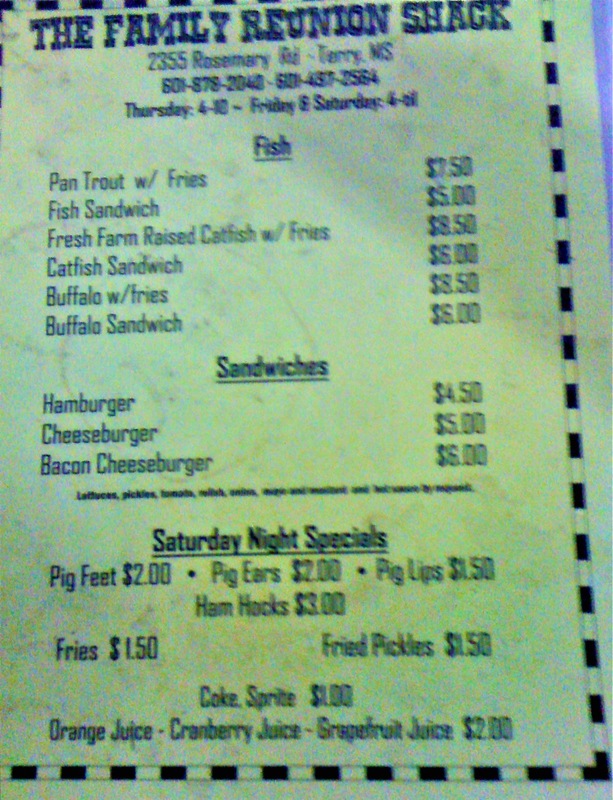 On Saturday nights, the menu offers pickled pig’s feet, among other specials. There’s no doubt this cloven-hoofed offering would please even the most discriminating connoisseurs of pork fat and vinegar; apparently, I’m just not one of them. At least now I know. One weathered regular asked how we got there. 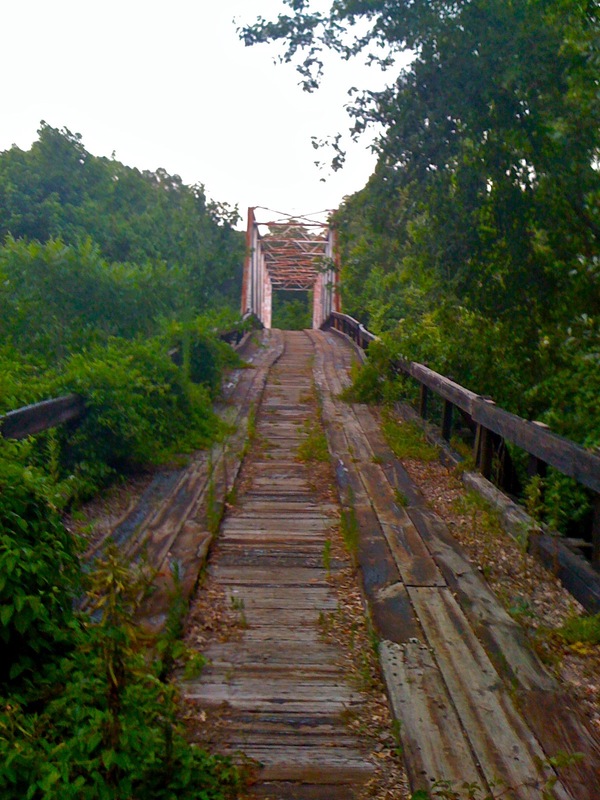 We shared our tale of finding the historic bridge on Rosemary Road, and actually driving over it. He informed us we did no such thing. With little daylight left, we drove back across Vaughn Creek in search of the other lost bridge on Rosemary Road. This time, we found it, in all its rusty, rickety glory. It was closed in 2009, after standing since the 1950s—or before, some locals say. Whatever it’s age, it’s old enough to have its own ghost story! Legend has it that the ghost of a woman who was murdered there long ago still walks the bridge at night. We were there from dusk till nearly dark and didn’t see another soul, living or otherwise. Perhaps we were too early. We did, however, see a beautiful view of the river, and that alone was worth the trip. But, beautiful and historic as it is, it’s unclear what will become of it. 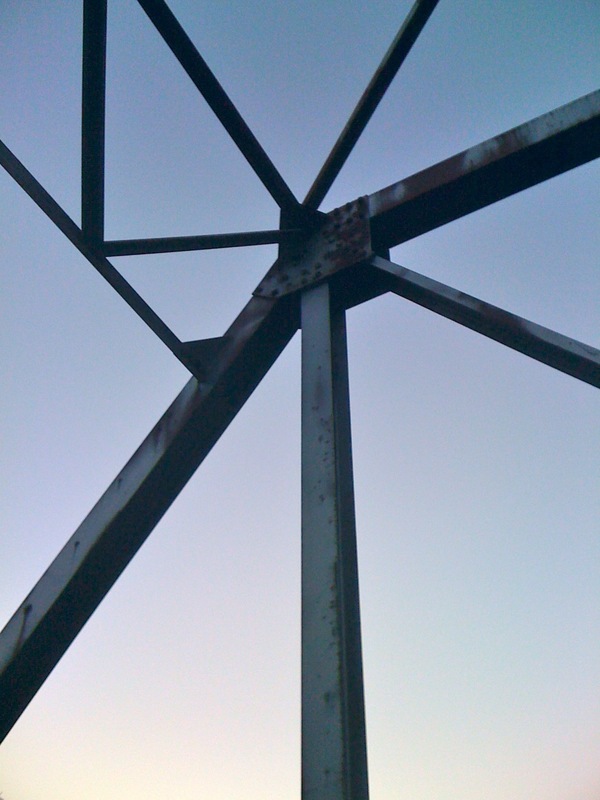 With a newer bridge just a few miles away, the city is unlikely to ever repair this one. But, by the same token, it’s just as unlikely they’ll ever tear it down. So while it’s entirely possible that we’ll one day lose this landmark to neglect, who knows? If enough people care to preserve it, it could get a new life—say, as a great highlight on a walking or biking trail, perhaps—and bring new value to nearby communities. If you like, grab your camera and imagine the possibilities for yourself. If you get hungry, you know where to stop!